Agia Irini is a traditional complex offering air-conditioned rooms with a balcony overlooking the Aegean Sea or the mountain. 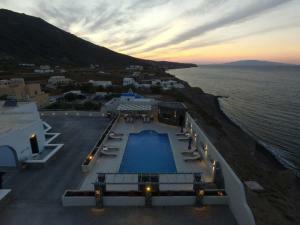 It is located 2 km from the town of Imerovigli. Please inform Agia Irini in advance of your expected arrival time. For this, you can use the special requests section when making the reservation or contact the accommodation directly. The contact details appear on the booking confirmation. Room with a balcony and views of the Aegean Sea. Apartment with a fully equipped kitchen, dining area and mountain views.